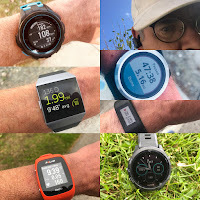 Pearl Izumi is a long time, high quality cycling brand which about 15 years ago launched into running shoes and apparel. 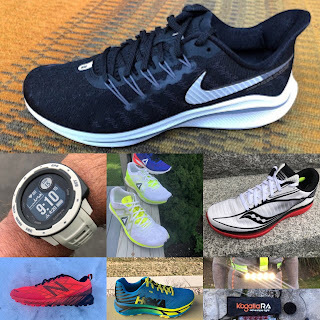 In running shoes they pioneered stitch free uppers and they continue to lead in that area with their 3D printed uppers. Over 20 years ago, thinking of cyclist safety, they launched their "Screaming Yellow" cyclist jackets. Flicker lower body(legs) and arms. Based on research conducted many years ago, this approach plays on the subconscious and our instincts to identify and track what we see. The product approach is called BioViz. Launched Fall 2015 for running and cycling, BioViz now comes to running. The focus is not only on night time running but low light and any time where color and contrast could alert a distracted driver. We tested Pearl Izumi's BioViz Flash Pants for men and 3/4 Flash Tights for women. But... before we get into the details... the Flash apparel and Fly shorts all have superb pockets that will hold an iPhone 6 in decently rugged case, bounce free. We always look for good phone pockets on apparel! Dominique has run in the Flash 3/4 tights ($60) for well over a month including at the very chilly Mount Desert Island Half in October as well as in much warmer conditions. "The Pearl Izumi Flash ¾ Tights are technically designed to optimize comfort and warmth, enhance visibility, flatter your silhouette, and are equipped with pockets. Training for the MDI half-marathon, and on race day, they proved to be the right pair of tights boosting my running experience by keeping me dry and warm despite temperature fluctuations. In the zippered back pocket, my phone stays safely in place in like manner to the wide waistband; nothing moves but my legs. Stylish and flattering, they are a great addition to your athletic wardrobe." I have been running in the Flash Run Pant ($90), what Pearl Izumi calls "a modern twist on the classic track pant". I don't like full length tights and if do wear tights tend to go with 3/4 length. I plan to wear the Flash this winter over the 3/4 tights and knee compression socks on the coldest days. The Flash Pant is made of very light weight, stretchy fabric. I have worn it on both warmer days and chilly breezy days and it is decently wind resistant while being super breathable. The two front zipper pockets can hold an iPhone 6 without it bouncing. Not sure how they pull that off but it works. As the pants have no elastic bottom hem my medium, which I assume is supposed to also fit runners taller than me at 5'10", is a bit long and in the way when out of shoes but no issue when running. Shorter runners may want to size down as the elastic waist is very stretchy anyway. In a nice touch the bottom of ankle zippers are protected by a small flap. And of course they are BioViz! I like the contrast! 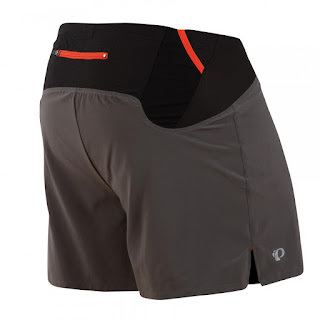 It may be getting a bit cold for shorts but we also tested the Fly Endurance Shorts for men and women this fall. They were my go to race short for 3 halves. Both the men ($60) and women's ($50) models feature very light and stretchy fabric, just long enough for us at 4"men's and 5" women's inseams, highly wicking mesh across the back, an anti bacterial Minerale liner, 2 drop in hip pockets for up to 2 gels per pocket, a functional mesh zipper pocket across the back which held our iPhone 6's with minimal bounce. 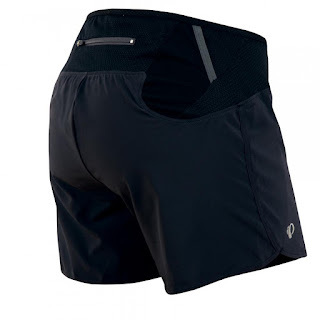 "The Pearl Izumi Fly Endurance Short has become my favorite pair of running shorts. The Fly provides comfort, style, and performance. The pocketing system – one zippered back pocket and two side pockets – allows me to carry my phone and a supply of gel packets for my long runs. A lifelong runner, I have never been a fan of the baggy look; these running short are tight fitting and flattering, yet extremely comfortable with just the right coverage, whether I wear them on the road or on the trails." Pearl Izumi apparel was provided at no charge. The opinions herein are entirely our own. RoadTrailRun is an affiliate of the retailers below. Running Warehouse has a wide selection of Pearl Izumi apparel with free 2 day shipping, and "No Sweat" easy returns. Use Road Trail Run coupon code: RTR10 at Running Warehouse checkout to get 10% off Pearl Izumi and many other brands.